A version of this story also aired on the Texas Standard, a public radio collaboration led by KUT, Austin, Texas. 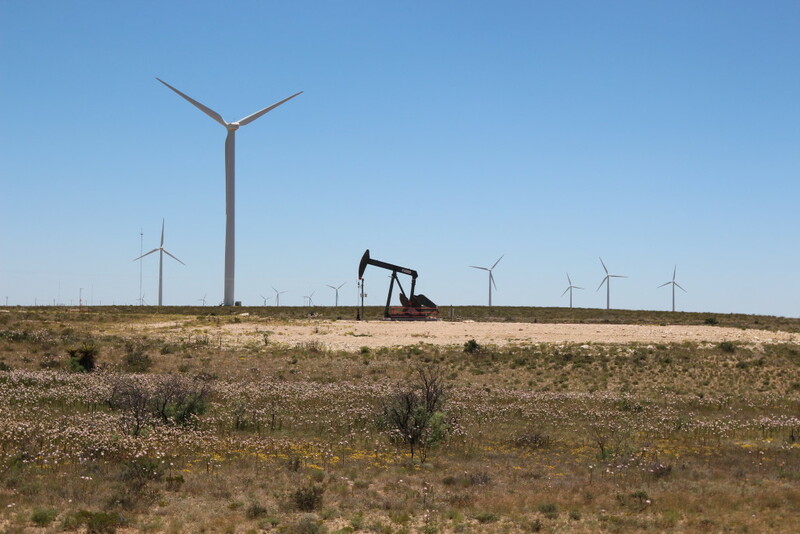 NOTREES, Texas–Energy production in Texas is dominated by oil and gas — but the state also leads the United States in the production of wind power. Some energy analysts suggest that wind power’s success in the Lone Star state has now become its challenge. State senators recently passed a bill that threatened to repeal a state law that required utilities to source a certain amount of electricity from renewables. For 15 years, that mandate has paved the way for wind power’s growth in Texas. In 1999, Texas told utilities, “put renewable energy into your portfolio.” Texans also started paying what today amounts to about nine more cents more a month per residential customer for electricity. The initiative was called the Renewable Portfolio Standard, or RPS. It was signed into law by then Texas Gov. George W. Bush. The RPS also subsidized transmission lines built specifically to bring wind and solar into the grid. Now around 10 percent of Texas’ electricity is generated from wind. Wind power for 90 percent of the Texas grid is controlled from a quiet, dark room in Taylor, Texas. The high security room is the nerve center of electricity operations in most of Texas. This is one of the world’s largest wind power storage batteries. Batteries can release energy when wind falls short of projections on a given day. It’s at an installation of 95 turbines operated by Duke Energy Renewables, the commercial business unit of North Carolina-based Duke Energy at Notrees, Texas. That free market mantra is embraced by many in conservative Texas. But the “end-subsidies-now” movement is disconcerting for investors in the wind business. This far in 2015, five states have introducedlegislation to cut or curtail renewable energy mandates. Jeff Clark leads the Wind Coalition, a wind power advocacy group. He told hearings at the State Capitol in Austin that elimination of renewable energy subsidies would stifle growth. Coal, oil, natural gas and nuclear are more established industries that continue receive government subsidies. To better understand the dynamics of the wind power market, we interviewed Ian Partridge, a Fellow at the Energy Institute at the University of Texas at Austin. “That’s something that other states really should copy,” he said. Texas currently receives approximately 10 per cent of its electricity from wind power generation. This entry was posted in fronteras npr stations, Resources and tagged austin, duke energy, notrees, notrees texas, production tax credit, renewable energy, wind power. Bookmark the permalink.